Essay from a World Away: Preserving history is a passion, but why? Coin collecting is a popular hobby in the US (remember all those crowds at the last conference?). And yet, coin collectors in the US represent just a small portion of folks that live and breathe numismatics in other countries. We recently received a request from a gentlemen in Pakistan to publish his essay with reflections on the hobby. Judge for yourself…. Preserving history is a passion, but why? History is something that you never forget. It is that part of your life that cannot be changed. You can only remember it and become happy or sad which depends upon the type of memories you have. There are many ways in which people can preserve and remember history. Some people like to write and read historical books, some like to take pictures and some like to collect ancient coins. Collecting ancient coins is not just a hobby or activity to do in free time. It is a passion which raises curiosity within us with the passage of time and which cannot be reduced. But the question arises that why do some people have passion for collecting ancient coins and what do they get in return for this passion. Some people have a special gene in their body which is known as the curiosity or inquisitiveness gene. This gene leads us to investigate past times and to know more about past. Collecting coins gave us glimpses of our past history. It tells us what our forefathers used as their medium of exchange. It educates and informs us about their economic, social, cultural and religious pattern of life by looking at the pictures on the coins. For example picture of Queen Elizabeth on British Pound coin tell us that she was the queen at the time the coin was used as medium of exchange. Collecting ancient coins is the passion which enhances our knowledge of history, economies, government, society, politics and geography and it increase our appreciation for art. People who like to collect coins take pride and honor of having ancient coins. They consider it as a personal accomplishment. Collecting coins is not a costly hobby. But one thing that it does require is time. You need a lot of time to collect and preserve coins. However, this disadvantage is nothing in front of the pleasure and pride a person gets when having ancient coins. It is a unique activity that does not have any age limit. A person aged 15 gets same pleasure and enjoyment collecting coins as a person who is 50 years of age. I have been collecting coins from the age of five and so far I have collected 120 which include coins of different regions like Pakistan, England, Hong Kong, India, Belgium and Saudi Arabia. My coin collection also includes about 60 coins of the Indian Sub-continent. The oldest coin which I have is of one quarter anna of the sub continent and it is from the year 1835. 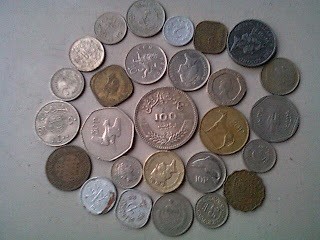 I just love collecting coins and it will remain my passion for my whole life. In short, collecting ancient coins is a wonderful hobby and passion for people as they enjoy the pleasure and delight of having tangible element of yesterday’s rich history in hand.